Okra, okra, okra, okraaaaa! I think if I were to go to prison for some food crime (like hating rhubarb, probably), fried okra would be part of my last meal. Growing up, I preferred this stuff over McD’s fries any day. Turns out, nothing has really changed with regard to that. 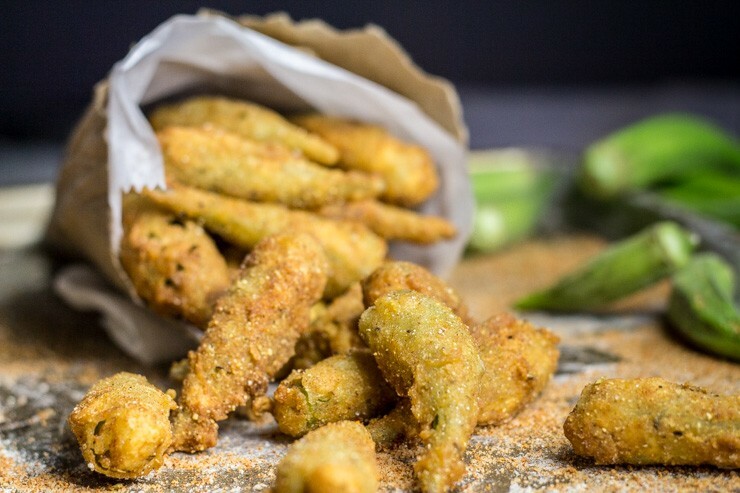 Since we are all adults here, I decided to twist things up a bit with some added kick– Cajun Fried Okra it is. Leave the little pointy tips alone. That’s like the best part. The fried exterior all comes together right there for a super-crisp bite. Chopping those off would be like throwing the corner piece of the cake onto the floor and kicking it into a dust-pan. Ridiculous. Flour, buttermilk, flour. Always. (Ignore the fact that the photo above completely lacks flour before it’s milk bath. I got overly excited like and totally screwed up the first round.) Stick to that plan and the shell wont slide off. Nothing worse than fried food that loses its’ crisp (literally) after one bite. Southern-style fried okra with a kick-- Cajun Fried Okra from SouthernFATTY.com. After washing & drying, Trim fresh okra tops. I prefer to leave whole instead of chopping into small pieces. 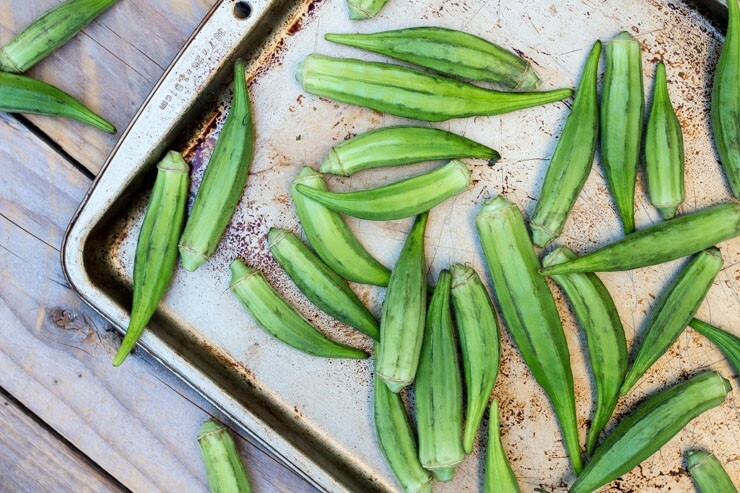 Transfer okra to a sheet pan to rest for 5-10 minutes. This will allow the outer layer to "gum up" and give a better, more stable crispy exterior. Enjoy! -- More on SouthernFATTY.com. 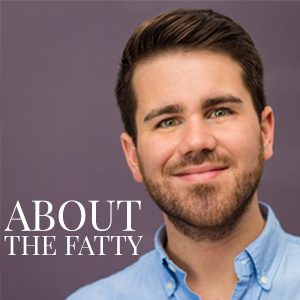 Tag your photos on social media with @SouthernFATTY // #southernfatty so we can see! I’m right there with you! I hate slimy okra. You’ll notice the slimy stuff when you chop the tops off, but the buttermilk solves it completely. A little bit of acidity actually gets rid of that. 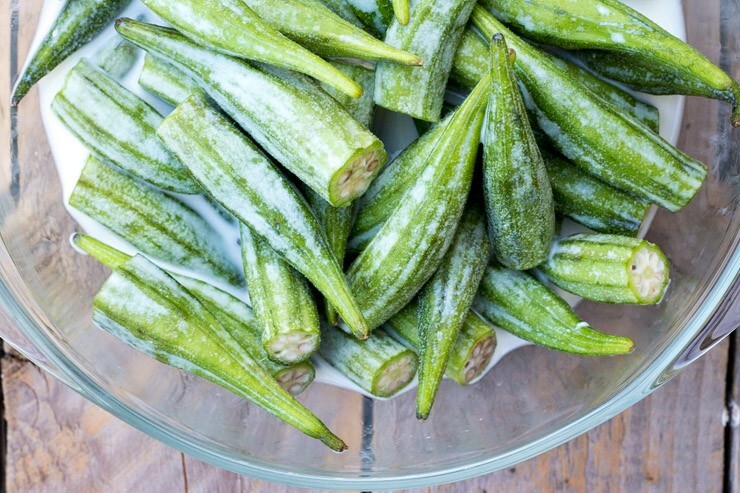 If you stew okra, you can dip them in a bit of water with a splash of vinegar and it helps a ton. These are just crispy and delicious. Enjoy! 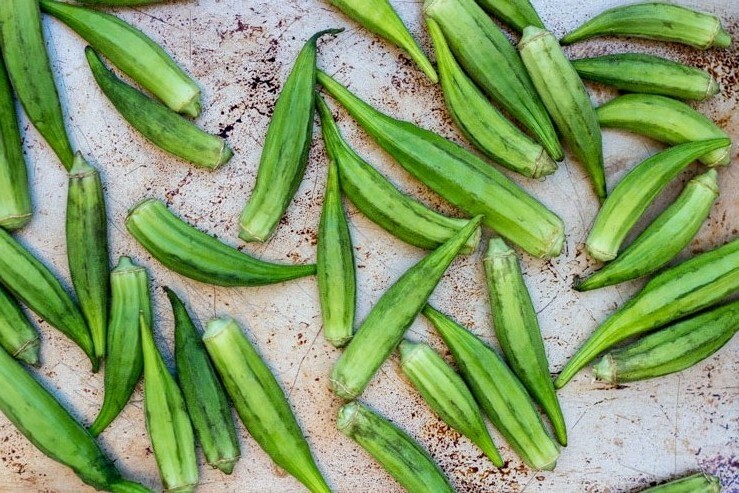 Okra is prrfectly wonderful grilled, too! Trying this kicking okra now. About to fire my skillet up. I’ll let you know the out come. Ccccan I mmmmmake this incredible sounding recipe wit em? Thanks in advance. Cannot WAIT to try soooo many of your recipes!!! Only bummer is I don’t have anyone to cook for …alas no pretty girl to call my own and enjoy being cooked for. Hmmmm…. I wouldn’t see any reason why you couldn’t use frozen okra for this. Just be sure it’s completely thawed and then dried thoroughly. Water isn’t a good friend when it comes to frying. Let me know how it goes! 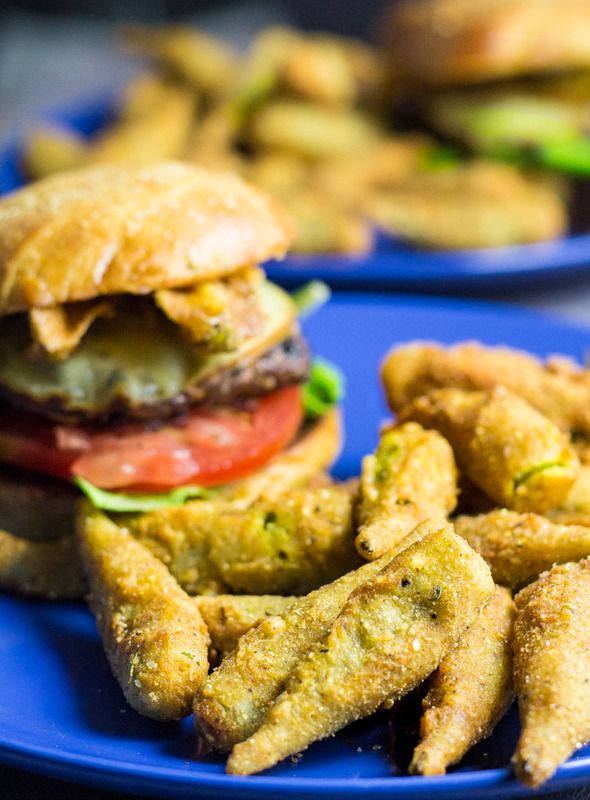 Mmmmm….fried okra. 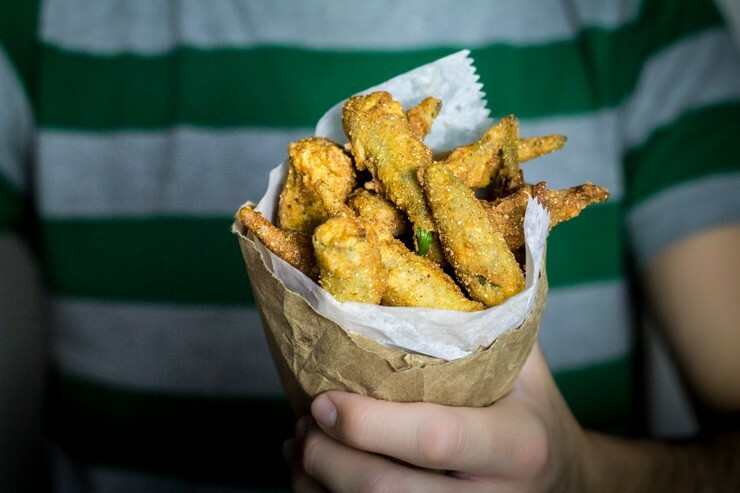 I actually judge restaurants by their fried okra. If we see it on the menu, we HAVE to order it to see if it’s frozen or actually hand-breaded. That sounds like a perfectly acceptable way to judge a restaurant to me! Timing! I just had two little okra seedlings come up in my garden yesterday! 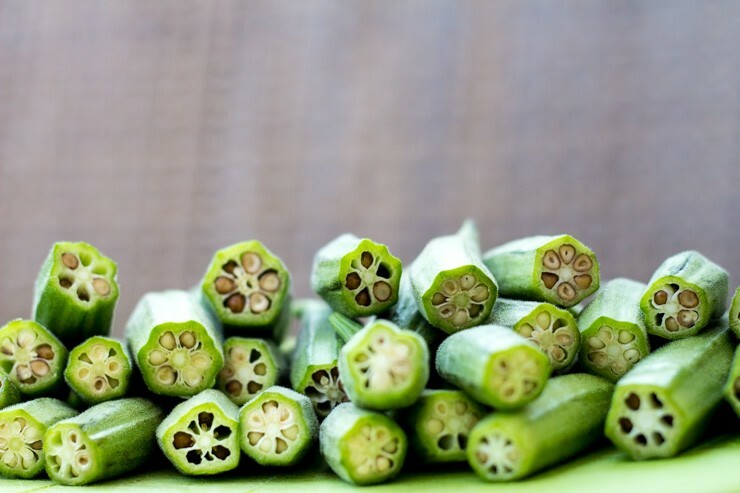 To be honest, I’m one of those who has never eaten okra before (doesn’t seem to exist in Salt Lake), so I decided to grow some this summer and figure out what to do with it. You have aimed me in the right direction with these fried beauties. Thank you. Honestly, frying is my fav. But okra is also amazingly good roasted or sautéed with some nice tomatoes. Good luck! I pinned this to my board Southern Food. And, I just moved into stretchy shorts season. We ABSOLUTELY have to try this. 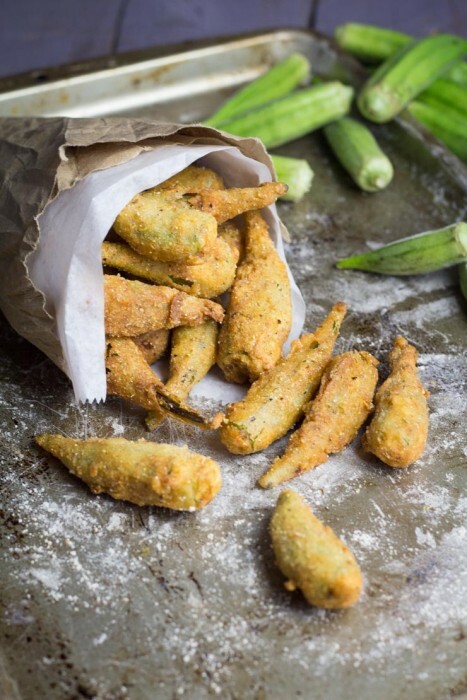 I love fried Okra!